Select the correct preposition to complete the sentence. 1. Why don't we talk (PREPOSITIONS CARD 23) this topic? 2. I arrived (PREPOSITIONS CARD 22) the building (PREPOSITIONS CARD 17) (PREPOSITIONS CARD 1 ) the bank. 3. The lecture is (PREPOSITIONS CARD 29) my understanding. 4. I stopped (PREPOSITIONS CARD 24) (PREPOSITIONS CARD 1 ) Detroit. 5. We must take him (PREPOSITIONS CARD 2) account. 6. Keep (PREPOSITIONS CARD 27) the grass. 7. It's important (PREPOSITIONS CARD 1 ) deal (PREPOSITIONS CARD 10) your stress. 8. That rumor was spreading (PREPOSITIONS CARD 11) the country. 9. He missed the train (PREPOSITIONS CARD 2) five minutes. 10. Many people applied (PREPOSITIONS CARD 1) that job (PREPOSITIONS CARD 1 ) the company. 11. Yuko was leaning (PREPOSITIONS CARD 21) the wall. 12. I will be back (PREPOSITION CARD 16) an hour. 13. This air plane flies (PREPOSITIONS CARD 21 ) Toronto (PREPOSITION CARD 10) Vancouver. 14. Let's move (PREPOSITIONS CARD 18) the next topic. 15. I'm getting (PREPOSITIONS CARD 12) (PREPOSITIONS CARD 10) my sister. 16. I would like (PREPOSITIONS CARD 21 ) see the town from a air plane far (PREPOSITIONS CARD 14). 17. 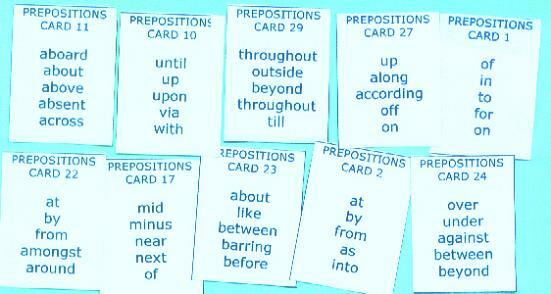 I looked (PREPOSITIONS CARD 26) the meaning (PREPOSITIONS CARD 21 ) the word (PREPOSITIONS CARD 21 ) a dictionary. 18. We could get (PREPOSITIONS CARD 3) the task. 19. What do you do (PREPOSITIONS CARD 5) the day? 20. (PREPOSITIONS CARD 16) this region, we can see flocks (PREPOSITIONS CARD 21 ) birds flying (PREPOSITIONS CARD 21) the south.